Who We Are What We Do Meet Our Franchisees Find Out More Is Back In Motion right for you? Spent a little too much time on the couch this winter? Hey, we know what it’s like! The weather has been awful, you’ve indulged a in little too much comfort food and your running has fallen by the wayside. We’ve all been there. But now the sun is peering out and it’s time to get back to feeling fit and healthy again. Getting back into running after a winter lay-off can be tough, but it’s certainly rewarding once you get there. While the benefits are obvious, getting back on the horse (so to speak) can put you at significant risk of injury and further delay your return to quality training. If you’re looking to start running again, there’s some important factors to consider to minimise your risk of injury. 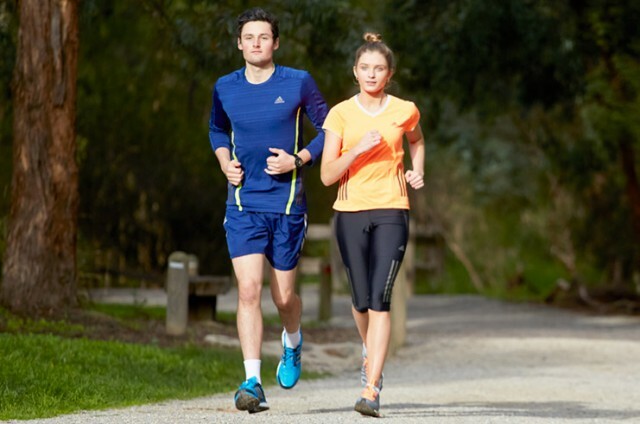 In this article we discuss some ways to help with a smooth and injury-free return to running. Even the very best athletes know that overtraining poses a serious injury risk. This is particularly true when coming out of a period of inactivity. Even if you usually train at a high standard, a few weeks on the couch or in front of a desk can have a huge impact on muscle length and activity. As a rule, if you’ve been off running for anything more than a few weeks, I’d recommend starting at no more than half your normal training distance and volume. So if you typically run around 10 kilometres three times per week, start at five kilometres for your first run. This can be frustrating at first for those eager to jump straight back in but simply try building this back up by around 10 per cent each run until you return to your previous training volume. Sticking to a three-times weekly training schedule, this would have you back at your normal distance in about three weeks. Also, reducing your intensity until you’re back at your normal training volume will benefit you greatly. As a general guideline, if you can return to your previous training volume in the same time that you’ve taken off (i.e. within one month after taking one month off), you can consider your initial training block a success. 1. Stiff or tight ankle. This can be due to tightness in the calf muscle complex, or from stiffness in the ankle joint itself. To perform an effective running stride, the knee needs to travel forward over the toes. When the ankle is stiff, this motion will be compensated for at other points in your body, which may lead to injury in the foot, the hip, knee and pelvis. 2. Tightness in quads and hip flexors. As with ankle tightness, we need adequate extension at the hip to allow the body weight to travel forward over the toes while running. A simple way to check hip extension and quads length is to pull the knee back just behind the line of the body, then pull the heel towards your backside. You should be able to touch your heel to your bottom in this position without arching your back. Calves provide a massive amount of drive while running. Yet all too often we see runners who are unable to complete even a few single leg calf raises with good technique. This suggests they are most likely not making full use of the remarkable system of levers and slings in the foot ankle and calf. At a minimum you should be able to perform 20 calf raises with correct form to help your running performance. 4. Inability to perform an unassisted single leg squat. A single leg squat is a great way to test your lumbo-pelvic stability. Stand at a mirror or get someone to video both from the front and side. Check that your hips and pelvis stay level, and if your knee travels in a straight line over your toes. This exercise is explained below. Now that you’ve identified any weaknesses, it’s time to turn your body into a more efficient running machine. There are many variations on the ideal running technique so it’s important to be realistic and comfortable. Nonetheless, there are a number of things you can do to correct any issues that may have built up during your winter hibernation. 1. Reduce tightness in the hip flexors and hamstrings. We’ve already mentioned tight hip flexors and quads, and this is a classic problem that we see clinically in athletes who spend their daytime sitting at work. The hip flexors and hamstring are placed in a shortened position, reducing the range of motion at the hip and creating tightness in the hamstrings. Remedy this with regular stretching of the hamstrings with hip extension exercises and mobility exercises like back rolls. 2. Improve your trunk and lumbo-pelvic stability. Another problem often associated with prolonged periods of inactivity. Sitting disengages the trunk and pelvic stabilisers, which can gradually weaken with non-use which can contribute to poor form and increased fatigue when running. One of the single best exercises to improve this is the single leg squat. It forces our stabilising muscles to be used in a position that closely replicates phases of running. If a single leg squat is too difficult, try using a step or bench under your back foot to assist with your form initially. A stiff spine can be equally as detrimental as an unstable one. Limited range of motion in the spine places increased pressure on the other areas of the body, including the hip and pelvis. Physiotherapy treatment is often used to improve spinal mobility, and there are also many exercises and stretches than can be used to reduce spine stiffness. To get started, try lying on your back and rolling your legs side to side on a fit ball, or pulling one knee at a time slowly into your chest. 4. Get the calf muscles working correctly. Too many runners don’t make full use of their most important running mechanism – the foot-calf-ankle complex. To ensure you are getting the most out of your calves, try performing calf raises while holding a ball between your heels. This will encourage you to transfer your weight toward your big toe as you reach the top of the exercise, and in turn improve your calf strength. Although many athletes returning to running forego thoughts of injury prevention in favour of just training harder, there is a lot of value in taking care of your body. Remember to stop and listen to what your body is telling you, and get professional advice from someone who knows not only your body but also the mechanics of running. That little niggle or tightness is often a sign that your body is not coping with the loads being placed on it. When incorporated well into your training, an injury prevention program can not only stop injuries, it can also lead to better performance and a more satisfying return to training.